They wanted to kick tenants out of these ugly buildings and move in yuppies. I for one am ecstatic to learn that the World's Dumbest Real Estate Deal has just officially dropped dead. I refer to the $5.4 billion purchase of Stuyvesant Town and Peter Cooper Village by Tishman Speyer Properties LP and BlackRock Inc. They announced yesterday that they've turned over the two housing complexes to their creditors. Ordinarily there's no reason for rejoicing over the death of a real estate deal, in this case the biggest one of its kind ever, but this one is an exception. That's because this particular deal was both odious and stupid. It was predicated on the new landlords' ability to evict large numbers of tenants and jack up the rents. But Tishman and BlackRock "forgot" that New York has the strongest tenant-protection laws in the nation, and the residents of those two middle-class projects weren't about to give up their apartments without a fight. They won an immense court victory, upheld in October by New York's highest court. The high court ruled that 4,000 apartments were illegally removed from state rent regulations, which meant that Tishman-BlackRock would have to pay $200 million in overcharges. A further deal with tenants was reached in December. Surprisingly, the brief New York Times article on the death of the deal didn't mention the court battle with tenants. One of the things that made this deal exceptionally idiotic was the intent to turn these two housing complexes into luxury apartments. These buildings were ugly as sin. Now, admittedly most New York apartment buildings are nothing much to look at. 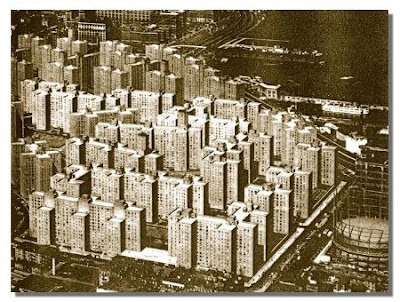 But StuyTown and Peter Cooper Village, built right after World War II as veterans' housing by Metropolitan Life Insurance Company, are indistinguishable from the low-income housing projects that were being built at about the same time in poor neighborhoods of the city. The apartments themselves were nice enough, but the buildings were sterile and without character. The same was true with Parkchester in the Bronx, which was also built by MetLife right after the war. Another problem with StuyTown/Peter Cooper Village is that lots of the apartment are on lower floors and/or have undesirable views, looking out onto parking lots or First Avenue. Sure, apartments with views on upper floors were desirable, but the existing tenants no doubt clung to them with a death grip. I remember Parkchester well from my Bronx days. It was in the middle of nowhere, much like StuyTown and Peter Cooper Village. The buildings were huge, and nobody wanted to live there if they could get apartments elsewhere in an actual neighborhood. Here's the irony: under New York law, the sins of the former owners are passed on to the new ones. Any penalties due to the tenants must be paid by the creditors. What a mess--and a well deserved one at that. What's amazing is that the people involved didn't do elementary research into New York state tenant laws before sinking billions into this asinine deal. UPDATE: Henry Blodget notes that nobody is discussing the morality of walking away from such a huge mortgage. That is true, there is a moral issue here for the creditors, but it pales before the morality of a real estate deal predicated on using legal trickery to toss people out on the street.